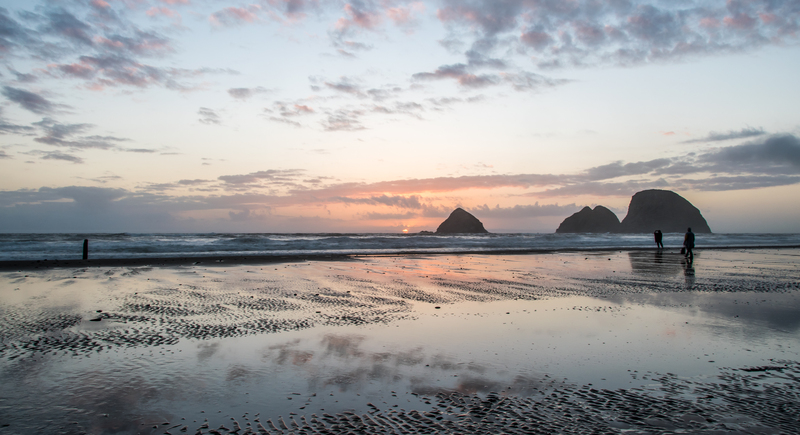 Oceanside is an idyllic coastal community located along the Three Capes Scenic Loop,* a 25-mile byway off of US Highway 101 between Tillamook and Pacific City. Perched up on a hilltop overlooking the Pacific, this town of little more than a few cafes and vacation rentals is the perfect spot for travelers who prefer to avoid the crowds that head to more popular northern Oregon coast communities. Oceanside Beach State Recreation Area sits at the doorstep of the small town, and it is the perfect spot to spend a sunny afternoon beach combing or exploring the rugged rock formations at the beach’s northern end. The unassuming Three Arch Rocks National Wildlife Refuge sits farther off-shore. Established in 1907 and designated by Theodore Roosevelt after persuasion from conservationists William Finley and Herman Bohlman, Three Arch Rocks was actually the first National Wildlife Refuge west of the Mississippi. The refuge is home to Oregon’s largest seabird nesting colony, including more than 100,000 nesting common murre and the largest colony of the iconic tufted puffin. The refuge is also a pupping site for the federally protected Steller sea lions, the larger of the two types of sea lions found on the Oregon Coast. You’ll have to bring your high-powered binoculars or a telescope, however, because the rocky islands are a half-mile out at sea and completely restricted to all human activities; even boats must remain 500 feet away.